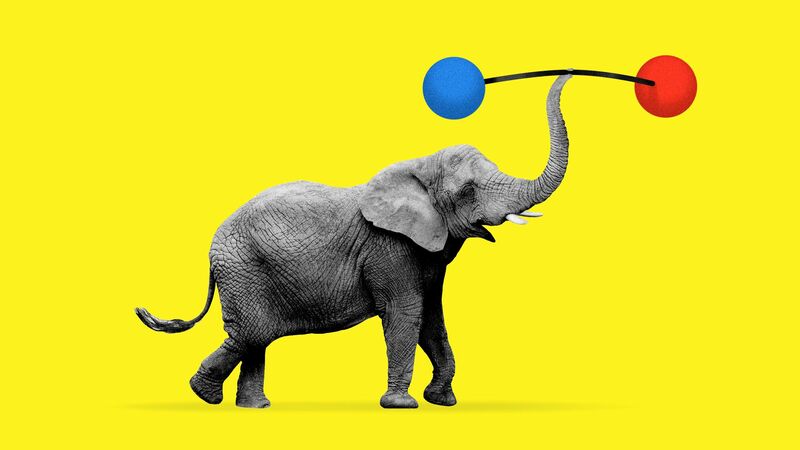 Republican officials have started calling the midterms the "Barbell Election." The big picture: A House Republican aide explains that Trump's approval ratings are like barbells: bulging favorables and unfavorables on each end, and few in the middle who have no opinion or are persuadable. "Those unfav folks are coming out," the official said. "It’s so, so crucial to get those base voters." That, in a nutshell, is why Trump headlined three boisterous "Make America Great Again" rallies in five days Florida on Tuesday, Pennsylvania on Thursday and Ohio last night. The raucous rallies aren't meant to convert or persuade: They're about turning Trump voters in 2016 into voters for local and state Republicans in 2018 — a process that President Obama discovered was anything but automatic with Democrats in his midterms. Trump said last night outside Columbus, Ohio: “Why would there be a blue wave? I think it could be a red wave." The Wesleyan Media Project, using Kantar Media/CMAG data, this week quantified a phenomenon we told you about last weekend: "Trump was referenced positively in 14.8 percent of federal election ads ... in the past two months, whereas President Obama was mentioned positively in less than 1 percent ... during the same time period in 2010 and 2014." Josh Schwerin, communications director of the progressive Priorities USA, told me: "There are going to be many races across the country where Trump will be the most important factor in the race, despite neither candidate mentioning him in an ad. He wouldn’t have it any other way." Trump "plans to host two fundraisers at the Trump National Golf Course in Bedminster, New Jersey, next week for House and Senate candidates." "He's expected to be even more aggressive in the fall. White House officials say he's reserving time on his schedule for midterm travel and fundraising likely to surpass that of former presidents George W. Bush and Barack Obama." The WashPost's lead story reports that the president is privately brooding while publicly roaring: "Trump loves the frenzied, raucous energy of these events, and often leaves them buoyed, people close to him said. At times, when advisers have proposed a rally in several weeks, the president has agreed to do it — but suggested they hold it as soon as possible." "Today is a perfect example," said a top GOP operative. "Instead of attacking Danny O'Connor [the Democrat in Tuesday's special election in Ohio] and helping [Republican] Troy Balderson he's attacking King James [LeBron, native of Akron]. Are we talking about the economy or whether we need ICE?" "He could easily be very helpful but has no interest in staying on message." Be smart ... An outside West Wing adviser told me: "Trump must be disciplined enough not to make it tougher in suburban districts, where his ego and deep denial could lead him to show up or dominate the news, delivering wins to Ds." Go deeper: "Key U.S. election matchups at stake in final big nominating contests."